You could also call these 'meta-attitudes'. They don't directly have to do with being better with other people, but having them will help the learning process go more smoothly. Like all attitudes, having them is easier said than done, and not just a logical matter of deciding they're good beliefs to have. You more have to slowly cultivate them. 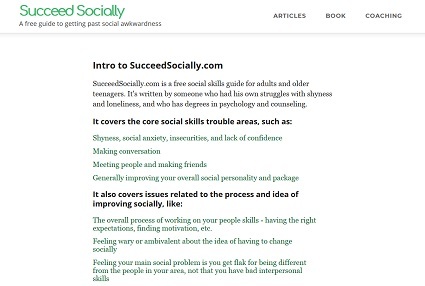 How Long Does It Take To Improve Your Social Skills? Secondly, if your perspective is focused on the bigger picture, you'll be able to handle the day-to-day frustrations of working on yourself more easily. Whatever your long-term goals are, you're going to be repeatedly practicing various skills as you work towards them. You're going to make a lot of mistakes. It's a part of learning anything. If your perspective is rooted in the short term then you'll get freaked out by every small thing that doesn't go your way. You'll let a bad week, or a single stilted conversation discourage you. From a broader perspective none of these little ups and downs matter. All that's important is that you're making steady upward progress over a longer period of time. If you're trying to get over your shyness, and the last month hasn't been too productive, what's it matter if a year from now you'll still be way more outgoing? It's pretty common for people to be too tough on themselves, think they have to be socially perfect at all times, and see little mistakes they make as the ultimate proof that they're unbearably awkward. Of course, that's not realistic. No one has a defect-free personality or makes the right social choices every time. We all have flaws that sometimes annoy other people. We don't always come off the way we'd like. Sometimes our conversations are forced and go nowhere. Sometimes we make corny jokes that don't go over well. You're not perfect, but neither is anyone else, and by-and-large most people still get by. Another thing, one that you've probably heard before, is that everyone has their insecurities. Good looking, seemingly together, confident people get nervous about things too. They worry about how they come across to their friends. They may also get insecure about little things that you have no problem with (e.g., feeling anxious when they first enter a party and everyone turns to focus on them). Finally, you can't win with everyone. Some people just aren't going to be drawn to what you have to offer. Hey, I've even heard criticisms of Ghandi and Mother Theresa. As long as you can get enough people to like you that you can have a solid group of friends, that should be enough. Free training: "How to double your social confidence in 5 minutes"
On the link below you'll find a training series focused on how to feel at ease socially, even if you tend to overthink today. It also covers how to avoid awkward silence, attract amazing friends, and why you don't need an "interesting life" to make interesting conversation. Click here to go to the free training. It's hard to improve yourself if you have a blind spot to half of your problems. Self-awareness takes a long time to develop. Putting your ego aside is important here as well. If you're too invested in seeing yourself as perfect and flawless, your mind will keep you from perceiving a lot of your weaknesses. We've all known someone with a ton of issues, who thought they were awesome, and that all the problems in their life were the fault of other people or outside forces. Of course, they were in no position to make any real changes. Viewing the world in extremes is a very common cognitive distortion. Some people have trouble improving themselves because they think of possible changes as being All or Nothing. They either remain totally true to themselves, or they completely sell out. They either never learn to make light small talk, or they become a vapid idiot who can only gossip about celebrities. They never teach themselves to mingle at parties, or they become a mindless drunk who kicks over mailboxes every weekend. They can't see themselves going to the other end of the spectrum, so they do nothing at all. Most changes can be made in degrees. You can choose a middle ground that fits your goals. You can mostly remain true to yourself, but make a handful of pragmatic changes. You can make small talk when the situation calls for it, but still have deeper conversations whenever you can. You can get better at socializing at parties, but while choosing not to drink or be rowdy. When I look back over my own social improvements I don't think this was the biggest factor in getting past my problems, but it's one that stands out in my mind. I consulted tons of other sources for advice, but overall I felt that I was the one charting the course of my own development. I took and used piles of outside information when I needed it, but it all came back to me calling the shots. If I didn't agree with some advice, and felt I had a good reason to disregard it, then I did, even if it had a good reputation. If I couldn't find a solution to a certain issue in outside sources, I cobbled one together on my own. Another big reason you need the ability to figure things out on your own is that no advice is going to cover every situation you'll personally encounter. So you have to be able to use your own intelligence to fill in the gaps. You won't always get it right, but you won't always get it wrong either. With time and experience your instincts will improve. So what goes into this? The ability to critically evaluate what you read for one. A non-passive attitude is also important. Don't just wait for someone to tell you what to do, unconsciously assuming that any of your own ideas aren't worth considering. Another important thing is not being too prone to hero worship. Or put another way, you don't put some person/author/speaker up on a pedestal, while simultaneously discounting your own views, or not bothering to form your own views at all. Yeah, you might respect a writer's work, and they may be more knowledgeable and experienced than you about an area you're interested in, but at the same time, you're closer to them than you think. They're people too. Their ideas aren't spotless. You know more than you give yourself credit for. You may even know more than some of the people you're taking advice from. They could just be hack marketers who anointed themselves as experts to sell you something. All this isn't to say that you should become self-deceptive, hyper-critical, and arrogant and write off everything you don't agree with. A lot of the time you do need to turn to someone else's suggestions. I'm more saying to have confidence in your own ability to pull yourself out of your hole and to not feel it's only going to be other people's teachings that can do it for you. People who are shy or awkward are often accomplished in other areas, but often have trouble carrying the attitudes that all helped them in those fields over to socializing. For example, a guy who would be persistent and power through a tough science concept, video game, or guitar song will be all too quick to declare he's hopeless after one poor conversation. Whenever you can, try to remind yourself that you've succeeded elsewhere, and that you can get the hang of socializing if you approach it with the same mentality. I'm Chris Macleod. 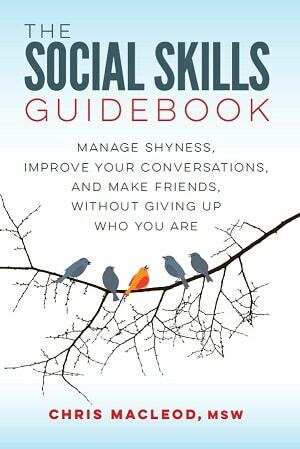 I've been writing about social skills for over ten years. I was shy, awkward, and lonely until my mid-twenties and created this site to be the kind of guide I wish I'd had at the time. I'm trained as a counselor. I have a Master of Social Work (MSW) degree, and a B.A. in Psychology. Copyright © 2006-2019 SucceedSocially.com. Please do not copy, reproduce, or translate any articles without permission.